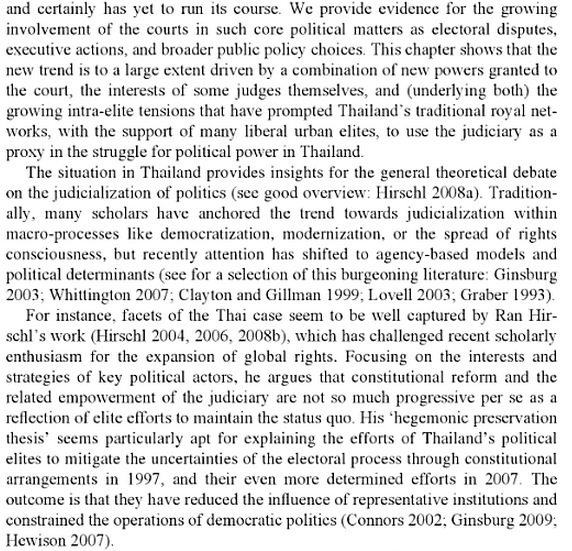 Thailand: Judicialization of politics or politicization of the judiciary? 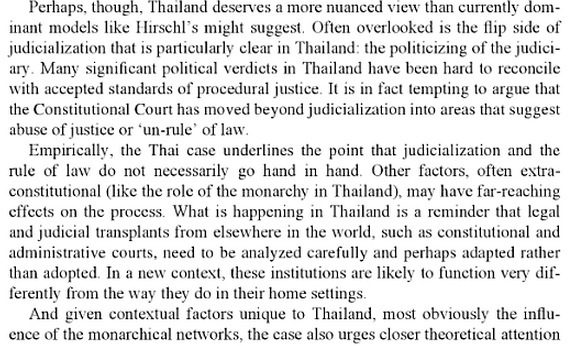 Thailand: Judicialization of politics or politicization of the judiciary? Thailand: Judicialization of politics or politicization of the judiciary? Björn Dressel, is an academic at the ANU who does research on politics and law primarily on Asia. Last year, he edited a book entitled ‘The Judicialization of Politics in Asia’. 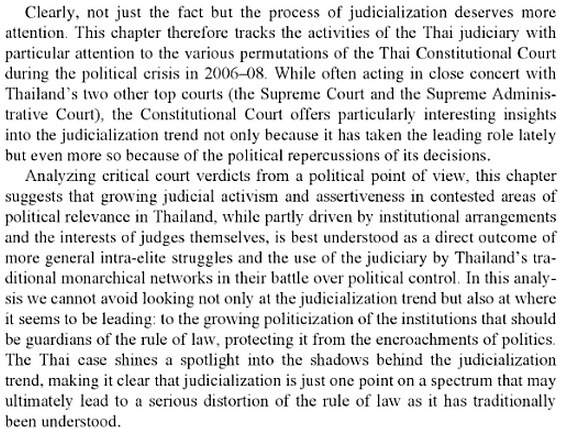 He wrote the chapter on Thailand entitled ‘Thailand: Judicialization of Politics or Politicization of the Judiciary‘. We have already seen the increased role that the judiciary has played in politics over the past few years, but we really need to go back to the Thaksin concealment case in 2001 for the first time in “modern, post-1997″ Thai politics where the court intervened politically and gave Thaksin the benefit of the doubt. Then, you can say there was a lull until 2006, but after HM the King’s speech in 2006 the judiciary’s role become more prominent. (In 2007, a former judge and then constitutional drafter stated “Even HM the King places trust in the judges; would you condemn them?”). The Court invalidated the April 2006 election and then judges refused to grant bail to the election commissioners (Kaewsan even criticized that decision) as the commissioners refused to resign. The result of spending time in jail was that the commissioners lost their positions and they were granted bail after that. In 2007, after the coup, we saw a changing in the balance of power in Thailand with the judiciary being given more powers under the 2007 constitution including being on committees to appoint Senators (who then in turn confirm judges) and members of independent agencies. Judges also choose against themselves who will fill the top positions in the judiciary. This meant that judges were no longer exercising only judicial power, but judges were still able to use contempt of court to limit criticism (also see these posts about contempt of court here and here )*. Nevertheless, this didn’t stop the judiciary from making public comments criticizing politicians and the political system and moved beyond appearing as merely impartial observers who are above politics. With all this power though, you still had the question on, who will guard our judicial guardians? The essence of the reason for separation of powers is as explained by Wikipedia that you “[n]ever give ultimate power to any one group; the executive, legislative, or judicial”. The 2007 Constitution gave, in BP’s opinion, too much power towards the judiciary. It was though in 2008 that the judiciary really started to assert its authority. You had the Samak case where Samak lost his position as Prime Minister because of his role on a cooking show deemed him to be an employee of the show and this was contrary to the Constitution- see posts here, here, and here. Then, you had the Constitution Court apply a very broad meaning to Section 190 of the Constitution when they ruled that the Communique with Cambodia on Preah Viehar was a treaty which needed parliamentary approval and hence as it didn’t have such approval, it was unconstitutional. This surprised the Foreign Ministry who had been approving the signing of MOUs for years and eventually the broad interpretation caused so many problems with even minor agreements needing parliamentary approval that this provision of the Constitution was amended last year. Yes, interpretations have consequences. Even now, there are concerns that things are still uncertain. BP: The post continues with more examples, but would agree with Dressel’s overall thesis….